The global governance framework is weak and fragmented with regard to plastics in the environment. 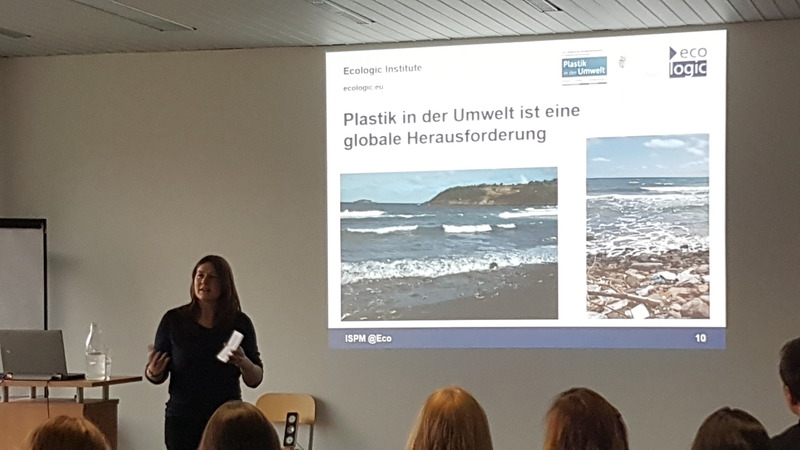 On 30 November 2018, Linda Mederake, Junior Researcher at Ecologic Institute, presented the Institute's activities in the field of plastics governance to a group of students from the International Degree Program Political Management (B.A.) at Hochschule Bremen, City University of Applied Sciences. The presentation took place in the context of an excursion of the study programme, during which the students got to know the "political Berlin" and exchanged views on several selected topics with various actors from research, politics, business and civil society. Linda Mederake first introduced the students to Ecologic Institute and its work as part of the accompanying scientific project PlastikNet. She then presented the study "No more Plastics in the Ocean" on elements for an international plastics convention commissioned by the WWF and explained the results of the journal article "Developing Countries in the Lead - What drives the Diffusion of Plastic Bag Policies?" Following the lecture, Doris Knoblauch and Linda Mederake discussed existing political initiatives and plastic policies as well as regulatory gaps in Germany with the students.